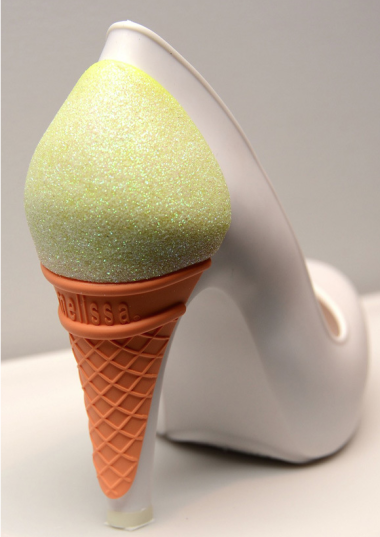 These cones were made for walkin: Fashion designer Karl Lagerfeld has created a line of shoes where the heel is decked out with a sparkly ice cream cone (right) or Brazilian plastic footwear brand Melissa. Another great find from fave blog Laughing Squid. NPR's On Point featured an interview with New York Congresswoman Louise Slaughter on the problems of antibiotic use in livestock. The shocking out-take: as many people die of antibiotic-resistant superbugs in the US now as die of AIDS. And just to prove that it doesn't have to be that way, The New Pork Gospel is a loving profile by Barry Estabrook of Russ Kremer, the pig farmer that inspired Chipotle's commercial in praise of small pork producers. The Beastie Boys' Mike D Runs a Free Food Truck in the Rockaway neighborhood of New York City, helping out residents hard-hit by Hurricane Sandy. For your weekend reading pleasure, we've found a new favorite food journal find in London-based The Gourmand. And it doesn't hurt that their logo looks a bit like the Pork Fairy. We will leave you with a few words of wisdom from Chef Thomas Keller on why it's desire and not passion that make the best cooks. "It’s not about passion. Passion is something that we tend to overemphasize, that we certainly place too much importance on. Passion ebbs and flows. To me, it’s about desire. If you have constant, unwavering desire to be a cook, then you’ll be a great cook...(more)"